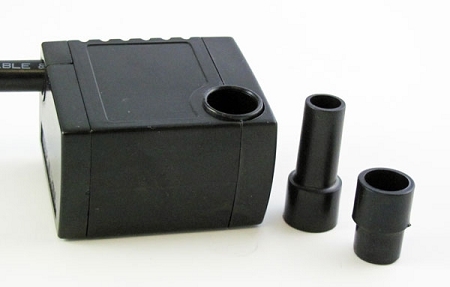 A very small utility pump that fits smaller fountains and aquariums and is an ideal replacement pump for many small fountain pumps. This compact pump features a low profile design and will pump in just 1/2 inch of water. The intake is fitted with a slide flow control to adjust flow. The unit has 3 small suction cups on the base for cushioning and noise suppression. One (1) year warranty. This pump is a suitable replacement for Rena Flow 300 (not 300S-IL), Rena S20, Alpine, Fountain Pro, Ocean Mist, Jebo, Peaktop and many other brands of small fountain pumps. A: Yes it is submersible. 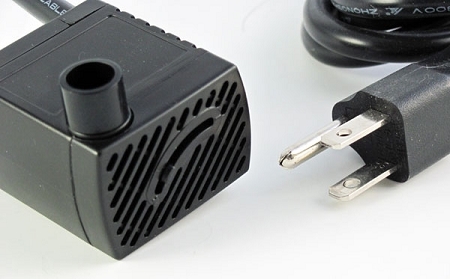 This is your best choice because the pump has a very low profile but still comes with a 3/8 outlet adapter which is the most common tubing used with the old S10. This pump is not as tall but with the addition of the 3/8 adapter is very close. Every fountain or other piece of equipment where S10's are used will usually work with the RO320S as well. We accept returns up to 30 days after purchase and we do have other pumps that we sometimes use depending on the installation. A: Your best bet is to call us. What you might be looking for is the impeller cover or possibly the small rubber bearing or bushing. Not sure by your description. We might have both.